This diamond-shaped ray is much wider than it is long, usually 3 to 4 feet wide, and its short tail lacks the ray’s usual spine. It can vary from light brown to gray to greenish, with lighter or darker spots, and can manipulate its shading to blend better into its background. It is tolerant of a variety of salt content, from brackish river mouths to highly saline lagoons, as long as there is a muddy or sandy bottom to hunt small fish and invertebrates. Common English names for this species include: lesser butterfly ray, diamond skate, butterfly ray, short-tailed lesser butterfly ray, and skeete. Other names include arraia (Portuguese), gladde vlinderrog (Dutch), korthalet sommerfuglerokke (Danish), krídloun hladký (Czech), motýlovec hladkýpari (Czech), gampret (Malay), perhosrausku (Finnish), raie-papillon glabre (French), raya guayanesa (Spanish), raya mariposa menor (Spanish), togenashi-tsubakuro-ei (Japanese), and uge-borboleta (Portuguese). This species is caught in minor commercial fisheries and is occasionally used for food in French Guiana and possibly in other tropical localities. The wings may be taken for bait in crab or other fisheries. This is a small ray that does not possess a spine. Therefore it represents little danger to humans. 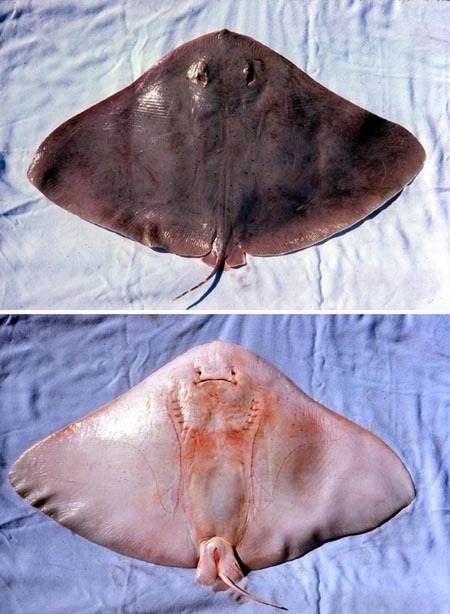 > Check the status of the smooth butterfly ray at the IUCN website. The smooth butterfly ray is found in the western and eastern Atlantic Ocean and in the Gulf of Mexico. 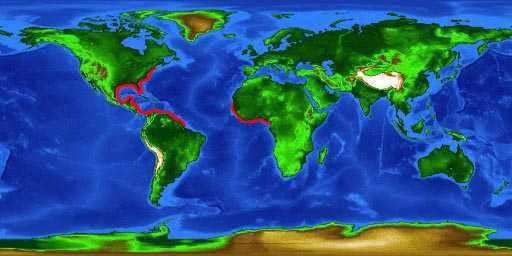 In the western Atlantic it occurs from Maryland to Brazil. It occurs in the Gulf of Mexico and northern South America to Brazil. It also occurs in the eastern Atlantic off the coasts of Senegal, Gambia, Sierra Leone, Cameroon and Democratic Republic of the Congo (to the mouth of Congo River). The smooth butterfly ray prefers neritic waters of the continental shelf and is usually found on soft bottoms. This species is known to enter brackish estuaries or hyper-saline lagoons. 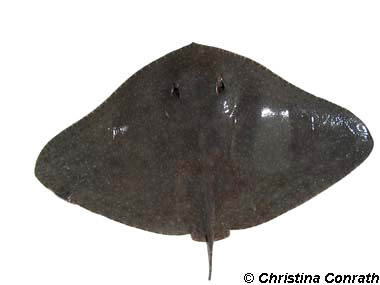 This is a broad, diamond-shaped ray with a very short tail lacking a dorsal spine and a protruding snout. The front edges of the disk are concave. The tail has low dorsal and ventral fin folds and three to four dark crossbars. 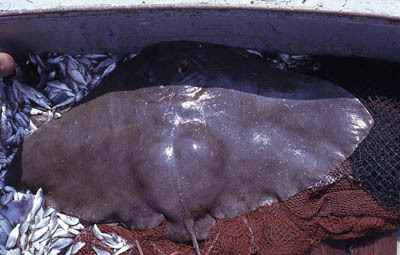 This ray can be distinguished from the spiny butterfly ray (G. altavela) by the absence of both a tentacle like structure protruding from the inner posterior margin of the spiracle and a caudal fin spine. The absence of a tail spine and the presence of a keel on the upper surface of the tail separates G. micrura from G. hirundo. 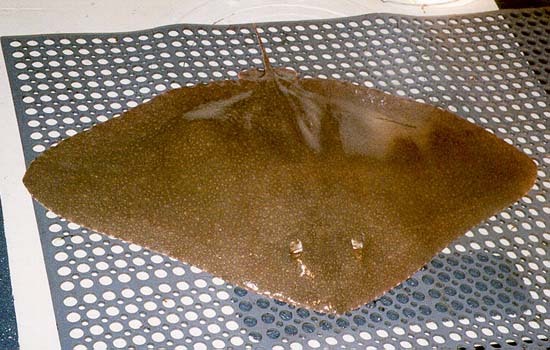 The dorsal surface of this ray is gray, brown or light green, dotted and vermiculated with paler and darker spots. The tail has three to four dark crossbars. The ventral surface is white. This species has some ability to adapt it’s shade to that of the bottom. The upper jaw generally has 60 to 120 teeth and lower jaw generally has 52 to 106 teeth, with each tooth having one short sharp conical cusp on a somewhat swollen base. Eight to nine rows of teeth function simultaneously. The upper dental plate occupies 70 to 75% of the width of the jaw and the lower dental plate occupies 60 to 65% of the width of the jaw. The skin is relatively smooth with small denticles. The maximum disc width of the species is reported to be 3 to 4 feet (0.9 to 1.2 m). Females of the northwestern Atlantic population pup when 25 inches (65 cm) wide, and probably at smaller lengths. Feeds on fish and invertebrates, more specifically: bony fish, benthic copepods, crabs, shrimps, prawns, and bivalves. Exhibits ovoviparity (aplacental viviparity), with embryos feeding initially on yolk, then receiving additional nourishment from the mother by indirect absorption of uterine fluid enriched with mucus, fat or protein through specialized structures. Potential predators include larger fishes and marine mammals. Bloch and Schneider first described the smooth butterfly ray in 1801. The genus Gymnura of the currently accepted scientific name is derived from the Greek word gymnos meaning naked. Synonyms for Gymnura micrura include Pteroplatea micrura, Raja micrura and Gymnura micura.